Description: The garden snail is a mollusc since it is an invertebrate (no backbone) which has a soft unsegmented body with an external shell. It has a soft grey coloured body, with two pairs of tentacles on it’s head (the larger pair have eyes on their tips and the smaller pair pick up smells) and a hard spiral-patterned shell on it’s back. The shell is yellow-brown in colour with brown-black stripes on it. The brown colouring is used to help camouflage the snail in woodland areas and the pattern helps the snail to blend in with vegetation. When garden snails move about they leave a silvery trail of mucus which helps them to travel over different surfaces more easily as the mucus reduces friction. Size: The shell on a garden snail is approximately 40mm wide and 35mm high. The slug-like body is between 80-90mm long. Habitat: Garden snails can be found living in a variety of habitats from gardens, hedgerows, woods and parks to coastal areas and chalk quarries. They need calcium for their shell and therefore like to live in areas where the soil is rich in calcium. The garden snail likes to inhabit dark, damp and well hidden areas. Food: The garden snail likes to eat the leaves of many plants and vegetables. It will also eat rotting fruit, lichen and algae. Breeding: The garden snail is a hermaphrodite and has both male and female sexual organs. It can produce both sperm and eggs, although it does need another snail in order to reproduce. Snails impregnate each other by pressing their bodies together and exchanging sperm. The breeding season is through the Spring and Summer months. Garden snails lay 20-50 eggs per batch which they bury in the ground. The eggs take approximately 3-4 weeks to hatch out. The hatchlings have soft and transparent shells. Distribution: The garden snail is very common in Britain and Europe. It has also been introduced to North and South America, Australia and Southern Africa. Months Seen: The garden snail hibernates in the Winter and spends hot and dry days in an inactive and dormant state. When this happens the snail withdraws into it’s shell and secretes one or more layers of mucus which hardens over the entrance of the shell to form a protective seal. During hibernation the snails tend to gather in large numbers. During the day the garden snail withdraws inside it’s shell and although they can sometimes be seen moving about in the day, the garden snail is active mainly at night. This snail is edible and is sold as escargot. The garden snail is now raised on special snail farms for the catering industry. The garden snail has a life span of about 2-3 years, although they can live longer. Birds are a predator of the garden snail, particularly the songthrush. If threatened by a predator, the snail produces a frothy substance as a defence. Click on the image below and go to Amazon.co.uk to find out more about this book. So I would definatley recommend giving them lettece to eat. 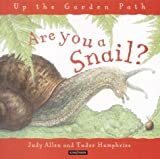 i have had common garden snails for pets and hav one question. how do you breed snails? I am breeding snails and i have a question. Can baby garden snails breed? It’s about a teenager one. i don’t know the age but roughly 2 months-1 year. i have kept a garden snail for a pet but have no idea what to feed it and how much to feed it. I am only just starting and need some advice. Please could you email me on what and how much to feed garden snails.